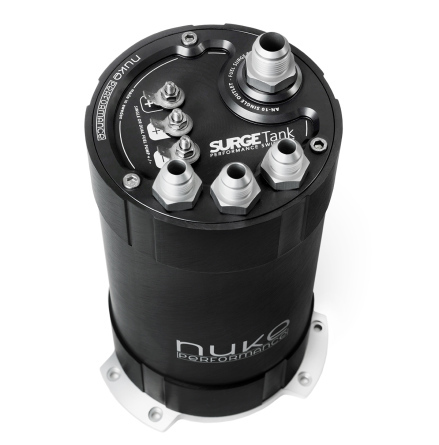 Universal Dual inlet Catch Can with internal baffling and 100 micron filtered outlet. Dual 7/8" AN-10 inlet, dual filtration breather for competition usage as well as for street and tuning usage. Equipped with 100 micron filter disc, prevents particles from escaping the catch can, filter disc is used both when atmospheric and recirculating setup is used. No external filter is needed when using atmospheric setup. The 100 micron recessed filter disc make sure to filter your crankcase gasses, in combination with the stainless steel internal baffling this Catch Can gives you outstanding filtration which saves your engine in the short and long run. 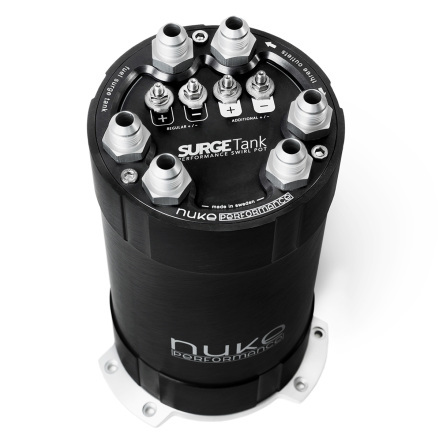 The Dual Inlet Performance Catch Can gives you maximum filtration, with a 100mic filter disc with its own surge protection mounted to the outlet port making the cans from Nuke Performance the first Catch Can that can be used both for atmospheric and recirculating setup without adding an external filter on top. All fittings included for both setups. Stainless steel bracket for universal applications. • CNC macufactured from aluminium alloy 6082. • Delivered with three 7/8 AN-10 fittings, one 7/8 plug, one outlet fitting for atmospheric use and 1/4 drainage plug. • Anodized finish for long lasting function and corrosion free appearance. • 100 micron stainless steel cleanable / replaceable filter disc and stainless steel internal baffling. * All measurements excluding the supplied or optional fittings.